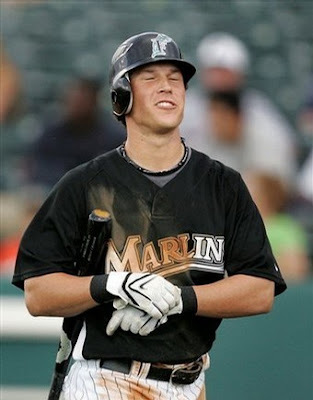 The Marlins have called up second base prospect Chris Coghlan and it appears that he will soon replace week one hero Emilio Bonifacio in the starting lineup. The early plan is to have Coghlan play multiple positions but as essentially a regular in the lineup. He made his first start at his natural second base position and the next in the outfield. If Coghlan is productive and Bonifacio continues to slump a change could be made very quickly. Coghlan is a disciplined hitter with strong contact skills. He has some pop and could hit around ten homers in a full season. He has just slightly above average speed but is a very good base stealer. He should accumulate 20-plus in a full season of at-bats. He is the player the Marlins project to eventually replace Dan Uggla at second base. Coghlan is a real prospect (Marlins #9 according to Baseball America) in a way that the well-traveled Bonifacio could never be. He will receive opportunities despite his production when Bonifacio could be replaced under similar circumstances. It seemed like Emilio was set to be a Michael Bourne type of player at a better position. This is the best move for the Marlins, but I'm not a fan as a fantathlete. There's nothing about Coghlan that screams start me. What I like about Coghlan is that he can actually hit. So many of the guys that we fantasy guys drool over could not hit their way out of a paper bag. Coghlan with his middling power and average speed (for an infielder) can actually hit. He knows which pitches to swing at and when not to swing. He can take a walk and get on base in a variety of ways. It is guys like this without the tools that we drool over that turn into the Dustin Pedroia's that we hate ourselves for not appreciating earlier. Instead we spend money on the Joey Gathrights and such that wind up being worthless.